shine brite zamorano: shine like a diamond. We are off and running at Zamo! As usual, I am starting the school year off with a collaborative project that is low stress and high impact. a little background- during the first week I meet with classes for 30 minute mini lessons. This allows me to review art room rules and procedures and to get students creating right away. Kids end up creating for about 20 minutes. This lesson always emphasizes unity and variety in both art and our school community and beyond. I make a point of introducing textile artists, fabric designers, and quiltmakers with these lessons due to the modular nature of the designs and because I feel that they are often neglected in art education and the art world. This year, I discovered the work of Tula Pink through instagram and her "TriDazzler" quilt jumped out at me from her feed. I love the repetition of the diamonds and triangles and how the colors repeat in a looser visual way. The main adjustment we made in our approach to Tula's quilt design, was that the center line of the diamond could be rotated either horizontally or vertically. 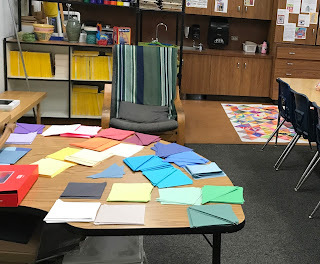 I precut a bunch of 6x6" squares that covered the spectrum of colors, plus any tints and shades of those I had available. I then cut a bunch of those squares in half. Before each class comes in, I place a square & triangle at each seat. As classes move through, I progress through the collection of colors I have to create a loose gradient across the install. I don't have a formula to the progression, it's more of a feel when having colors enter and exit, and re-enter the overall arrangement. Students glue the triangle onto their diamond. Students rotate their diamond, so the center line is horizontal. Students add lines from the top and bottom of the diamond to the center line. They need at least 2. Students add any colors like like to their smaller triangles, leaving at least one piece the color of the paper on top and bottom. Students put glue on the back of their diamond. 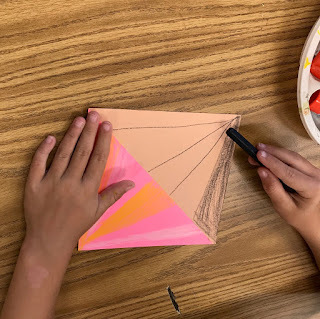 Students bring their piece to the larger paper quilt and place it on, making the decision to have the center line vertical or horizontal, repsonding to the diamonds already in place. I still have 2 days to go. I am out of space to assemble the full install on my tile floor. There are 14 classes that will take part in this over the next two days. My plan is to add one more section of length to make it 22' long and one more section of height along the whole thing to make it 9' tall. The final install will go on the back wall of our auditorium, so that we have have a dynamic piece of art up by the second week of school. I can't wait to see this whole piece assembled on the wall. It's always interesting to see these come together and it's particularly cool to see it in different ways- the diamonds up close during the activity, on an angle while up on a ladder above my floor, to the finished piece to take in while standing back from it. Our kids are always stoked to participate and watch it grow, too. Depending on the size of your school, you could have everyone take part. I showed this to some of my students and they asked if they could make one...I think we will give it a go. I'll for sure cite you and post updates! Fantastic! Can't wait to see your students' work! Did students use oil pastel or crayons? Is that card stock or construction paper? Thank you for this idea. I am an art teacher and a few years ago completed a t-shirt quilt that incorporated beautiful fabrics. I am going to use your lesson, but will adapt it somewhat. Will definitely cite you. Cool, Ruth! I'd love to see your t-shirt quilt:) looking forward to seeing what you do with this idea! I am so totally honored and flattered that you would be inspired by my work with quilts. The nature of quilting is collaborative and to see it interpreted in this way by your creative hands is so inspiring. I am grateful for the care you have all taken in honoring my design in this way. I am blown away by the creativity and talent that you have brought to this stunning project. thank you so much for sharing it with me and I will continue to watch the progress! Hi, love this project and your blog. What did you use to mount the whole project on? what kind of paper or substrate did you use to mount it? Terrific collaboration project! So many connections! STEAM, Elements and Principles... Kudos also for celebrating not only fiber artists, but also women artists! Thanks for the great idea. We just completed the project with about 600 5th and 6th graders and they loved it and it turned out even better than I thought it would! Thank you for the inspiration! I just completed this collaboration with my students in San Antonio, Texas. The mural came out beautiful with an artwork from every artist in my campus. Thank you to Ms. Tula Pink as well for sharing her wonderful quilting ideas! I’ll share pictures once I figure out how to post them, if it is possible. Thank you again! want facebook likes share and comments...so what are you waiting for this is the real deal right here right now to buy the real likes . The effect of hitting a ring or wristband on a doorknob or the steady wretchedness of a spring fasten on your jewelry locks gradually adds to its "metal weariness".